This “Garden Isle” has a reputation for being wetter than the other Hawaiian islands. Perhaps the north side rainforest climate of Kauai sees more rain, but the south shore is dry and sunny. And who cares about rain when it’s warm and the scenery is breathtaking. Temperatures here range from 70 degrees and 85 degress. The south shore boasts fabulous resorts, amazing snorkeling and water activities, Waimea Canyon, island history and quaint villages. The lush north shore offers famous golfing, luxury resorts, tropical splendor, folklore, waterfalls and towering cliffs. Although, this is one of the smaller islands, a rental car is the most leisurely way to see all of what Kauai provides visitors. You’ll want to visit one of the island farmers markets, look for turtles from the south shore, stop at the lighthouse, walk to a falls and enjoy fresh fish by the road up north. 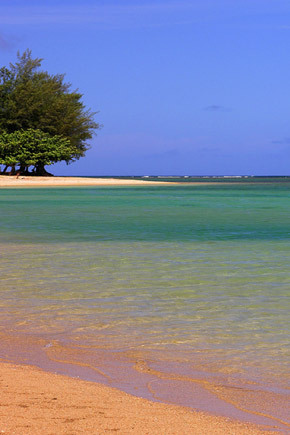 These would be impossible to enjoy on Kauai without booking an island rental car.